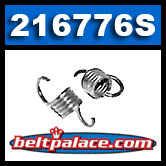 Comet 216776S Clutch Springs for Hoffco Tiller Clutch 213774A (PPFTC14). Home > Comet Clutches and Parts > Comet 216776S Clutch Springs for Tiller Clutch (PPFTC14). Comet 216776S Clutch Springs for Tiller Clutch (PPFTC14). Comet 216776S Clutch Springs for Hoffco Tiller Clutch 213774A (PPFTC14). Sold as package of (2) Two springs.